I already talked quite a bit about Disney's Frozen (2013) in my Response to Stefan Molyneux's The Truth About Frozen but I feel this movie deserves some more elaboration outside the context of weird YouTube pseulosophers (if that's not a word, I'm claiming it) over-analyzing things they clearly don't understand just to ruin it for their daughters. As such, here are some of my thoughts on Disney's Frozen, primarily I'd like to dig into the cliche of True Love's Kiss around which the final act is centered. There will be spoilers for Frozen (and some for older Disney animated movies). The story is about two sisters: princesses Anna and Elsa of Arendelle, the latter of whom was born with ice powers. After accidentally blasting her sister with ice, Elsa gets isolated until she learns how to properly control her powers and Anna's memories of Elsa's powers are wiped. Unfortunately Elsa's isolation and anxiety only causes her growing powers to become even more uncontrollable as she grows up. Then during her coronation as Queen of Arendelle, in front of her entire kingdom, she loses control and in her panic she accidentally freezes the entire kingdom, after which she exiles herself. Anna then takes it upon herself to go into the mountains to find her sister, repair the relationship that was broken for 13 years and find a way to unfreeze their kingdom. First of all, I love the movie. I don't think it quite deserves its spot as the highest-grossing animated film of all time but I still think it's a great movie (although number 2 on the highest-grossing list is Minions so at least Frozen prevented worse). My main issues are that Anna, although a very fun character, lacks the appeal to make her iconic on the level of a Disney Princess as well as a number of questionable story decisions that were likely the result of having to rewrite the movie without Elsa in the villain role. There's also the trolls and especially Olaf that feel like they were added primarily to sell toys to kids (only for it to be the Elsa dolls that were consistently sold out). While it is certainly a good movie, I don't think it quite reaches the level of quality of the princess movies preceding it. During the final act an accidental ice blast to Anna's heart is causing her to slowly freeze to death from the inside. Advice from the wise troll leader Pabbie reveals that an act of true love will thaw a frozen heart. Immediately another troll jumps in and assumes that it must be a true love's kiss, causing Kristoff to storm Anna back to Arendelle so she can get a kiss from Prince Hans. Ultimately Hans proves to be a deceptive manipulator who sees this situation as an opportunity to claim Arendelle for himself by letting Anna die and then ordering the execution of the 'traitor' Queen Elsa. The real act of true love then comes in the form of Anna sacrificing herself to protect her sister Elsa from Hans' sword. It is the expectation that the troll's assumption is also the audience's assumption that, I feel, dates the movie horribly. It's an overly transparent attempt at subverting and thus falls flat. The thing with the True Love's Kiss cliche is ... that it really hasn't been a thing in ages at all. 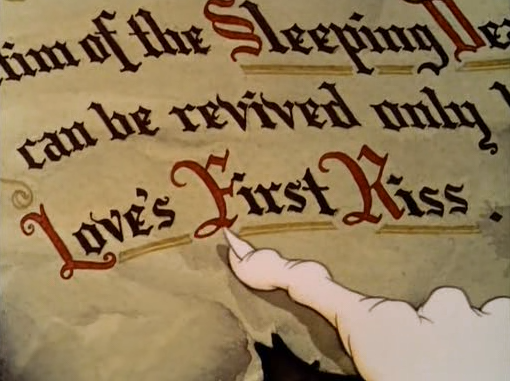 In Snow White and the Seven Dwarfs (1937), a princess under a sleeping curse is awoken when the prince she's in love with finally finds her and kisses her. However even there the curse specifies that it is Love's First Kiss, not True Love's Kiss, which is already a significantly lower barrier. A similar situations happens 21 years later in Sleeping Beauty (1959), where it is indeed specified that the kiss must be true love's kiss. And then ... what? In just a few years time we've had several Disney properties, such as Once Upon a Time (2011), Maleficent (2014) and Frozen (2013), struggling at subverting the cliche when the subversion itself is now a better represented cliche. Let's run down the traditional Disney Princess movies where, according to expectation, the cliche could show up. At the start of the Disney Renaissance with The Little Mermaid (1989) the concept of a true love's kiss is already being more subtly subverted. Ariel requiring a true love's kiss from prince Eric is explicitly an unreasonable demand from the sea witch Ursula, with which she intends to trap Ariel as leverage over King Triton. In the end that kiss never happens. The Beast's curse in Beauty and the Beast (1991) is lifted because he and Belle simply got to know each other and fell in love; no kissing required (my personal interpretation is that by accepting his own death, he had truly set Belle free and thus proved he understood how to love. Also for your accusations of Stockholm syndrome, please go [here]). Princess and the Frog (2009) once again plays around with it, in that prince Naveen just requires a kiss from a princess as an unreasonable constraint by Doctor Facilier. When he kisses Tiana early in the movie, ostensibly his true love by the end of it, instead she is turned into a frog for not meeting the requirements. Then in Tangled/Rapunzel (2010) there is once again no magic kissing, instead the solution comes from residual healing magic still inside Rapunzel healing Flynn's wounds through her tears (okay that sounds weird out of context). Cinderella (1950), Aladdin (1992), Pocahontas (1995), Mulan (1998) had no curses requiring kisses. In the periphery of these movies (the unofficial Disney Princesses), Alice in Wonderland (1951), Peter Pan (1953), The Black Cauldron (1985), The Lion King (1994), The Hunchback of Notre Dame (1996), Hercules (1997) or Tarzan (1999) didn't have magic true love's kisses either. So that puts the grand total of straight-up True Love's Kiss movies at ... two, if we're being generous. The last movie of which, and the only one that really qualifies at all, having been released well over 50 years ago. This is like "The Butler Did It" of modern fairy tales: It's only a cliche because people mistake it for being more prevalent than it really is. Disney movies have been subverting the cliche for 30 years and have done it way more subtly and effectively than Frozen did. Reverting all that and attempting to forcefully subvert a cliche that was barely relevant in the first place dates the story and makes it awkward to take seriously. During the early stages of the movie's production it was always the intention to make Elsa the actual villain of the movie. That changed when the crew started to really feel for her and realized that up until her transformation into the Snow Queen, she hadn't done anything wrong. Rewrites to accommodate Good Elsa is probably why certain plot elements from the second half feel so messy, but I feel the changes to Elsa herself do make her into a more compelling character than she would likely otherwise be. Throughout the entire movie there's still an undercurrent of the intention to make her a villain, but the fact that she then doesn't end up as one is actually touching. The name 'Elsa' does not sound villainous like how 'Maleficent' sounds like a synonym for- or a misspelling of 'malevolent' (which is also why it was stupid to base an entire movie on how Maleficent wasn't just a tragic villain, but an actual hero who just had a really bad day that one time). Still, Elsa's name has a certain synesthetic sharpness to it (See The Bouba/Kiki Effect). This already differentiates her from the other Disney princesses, most of whom have names with more rolling r or l sounds. Consider the most similar name among the princesses: Ella, Cinderella's birth name in the live action adaption. 'Ella' rolls. 'Elsa' feels like there's a sudden stop in the middle. As such her name alone already makes her sound somewhat harsh. The first 30 minutes of the movie leading up to Let It Go sets up the perfect environment for Elsa to eventually snap and put her into an anti-villainous role. Let It Go itself is the breaking point where she finally lets go of her good girl persona and embraces pure selfishness. However it is quickly revealed that the song was just Elsa lying to herself in a moment of ecstatic relief that she finally got to express herself through her powers. She wasn't actually descending into villainy at all. Despite having all the mental baggage to justify it, Elsa never crosses the line. The only time she ever comes close to crossing the line is in self defense against people who are actively attempting to kill her. In the end it is what makes Elsa so engaging: it would be perfectly understandable for her to have gone evil, but her strong moral center prevents her from crossing that barrier. She is one of the most powerful heroes Disney has ever created, yet she evokes sympathy by also visibly suffering from anxiety and depression over what her powers have put her through and what they could potentially do to others. In that sense you could say she's an even more emotionally-charged version of the Genie from Aladdin, who despite his phenomenal, cosmic powers only wanted to be free (itty-bitty living space). It also makes Elsa a foil for Rapunzel. Both characters have incredible powers, but they differ in that Rapunzel has beneficial healing magic that requires effort to bring out while Elsa has (until she learns control) destructive ice powers that she's unable to restrain. They were both locked away and have significant anxieties regarding their powers, but Rapunzel was taught to be scared of people who would abuse her gift by an abusive adoptive mother while Elsa is afraid to hurt her loving family. In personality Rapunzel is outgoing while Elsa is restrained, which translates into Rapunzel wanting to escape her tower but being afraid to go while Elsa voluntarily exiles herself into her ice palace. Both characters are primarily imprisoned by their anxieties and insecurities. Frozen and Tangled are thus exercises in how a character archetype (the classic Disney Princess) would grow if you add a specific power into their development. Movies in the Disney Animated Canon tend to have very little overlap between each other. Still many of the movies have cameos or references that can reasonably link some of them together, although often just as a joke (there being a Beast toy in the Sultan's collection probably doesn't mean Aladdin and Beauty and the Beast are related). 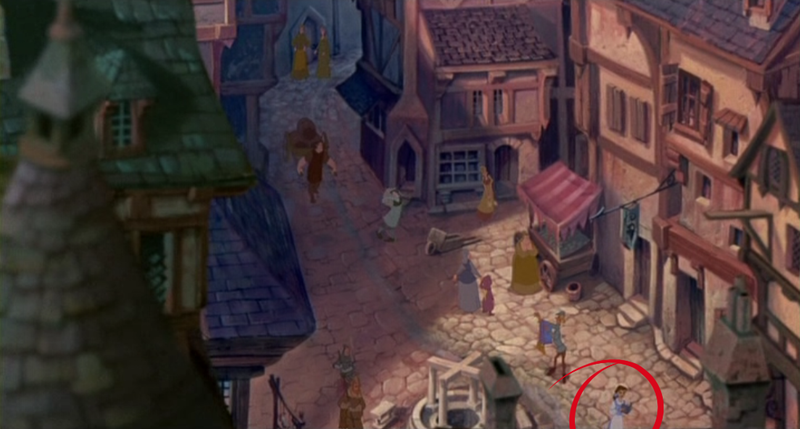 For example, there's a scene in The Hunchback of Notre Dame where Belle is visible in a shot of Paris. Since both movies are set in France, there's the possibility that Belle and her father lived in Paris until they had to flee Frollo burning Paris in his search for Esmeralda, ending up in the little town near Beast's castle. Possible the most obvious example of crossovers happens in the episode Hercules and the Arabian Night of Disney's Hercules: The Animated Series (1998). Jafar, having been defeated and killed in The Return of Jafar (1994), ends up in the Underworld and meets up with Hades. First they make a bet that they can get rid of their rival's arch enemy, which they both fail to do. Ultimately they devise a plan where they attempt to get rid of their respective hero problems by setting Hercules up to fight Aladdin, revealing that at least the adult section of the Hercules (1997) movie takes place long after Aladdin and the King of Thieves (1996) has already concluded. For Frozen there's a fan theory that it is linked with both Tangled (2010) and The Little Mermaid (1989). Linked with Tangled because Rapunzel and Flynn Rider have an actual cameo when the gates are opened near the start of the movie and with The Little Mermaid because the ship Ariel investigates at the start of her movie might be the sunken ship of the king and queen of Arendelle. Arendelle is Norwegian-inspired while Eric's castle would be on the shores of Disney's equivalent of Denmark, so there's definitely some geographic proximity to back that argument (I've also heard an extension where it is theorized the king and queen survived the sinking and ended up becoming Tarzan's parents, but that sounds a bit too far out there). So if we're to link it all up, Rapunzel and Elsa would be roughly the same age, with Rapunzel likely being older depending on how long after her eighteenth birthday she and Flynn got married. Tangled would take place first with the Rapunzel's marriage (which Anna and Elsa's parents were allegedly on their way to) being the indirect cause of Elsa's parents being lost at sea, setting up the events of Frozen three years later. 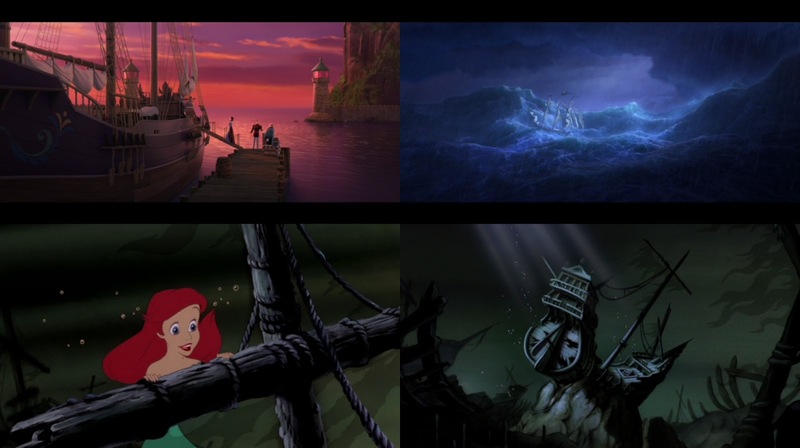 Then an indeterminate amount of time later the royal family's sunken ship gets looted by an inquisitive mermaid at the start of The Little Mermaid. I mean it's not exactly some great insight since it's just a fan theory but it is kind of cool I can watch three of my favorite Disney Princess movies as sort of a pseudo-trilogy. I would call it Disney's Scandinavia Trilogy except Tangled's Corona being in either Germany or Poland might make that a bit of a geographic stretch.